Laser therapy in dermatology often results in unexpected side effects. A lot of dermatologists may often encounter difficulties from such unexpected side effects. Appropriate response to side effects is one of the most important aspects of procedure. We prepared this opportunity to discuss various side effects encountered in dermatology. The author is Prof. Lee Jonghee in the Department of Dermatology of Samsung Medical Center. Prof. Lee will introduce various side effects encountered in clinical practice, with measures to be taken for such events. We hope this series on procedural side effects would be of great help to our readers. 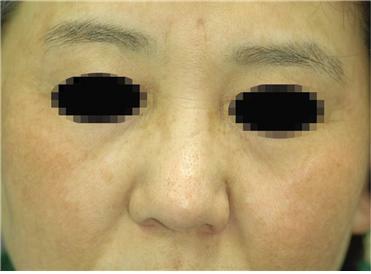 A 53-year-old female patient presented with facial hyperpigmentation. In her case, hyperpigmentation developed after cosmetic treatment she received two years ago for improving elasticity. There were no special features in her medical history. At a previous dermatology clinic, she received MTS and medication in 2-week intervals for several months to no avail. She also tried Radiofrequency treatment followed by regenerative and whitening care but did not experience any benefit. She denied having any pigmentary lesions or melasma prior to the treatment she had chosen for reducing pores and improving elasticity. The patient experienced menopause three years ago and was not on hormone therapy. 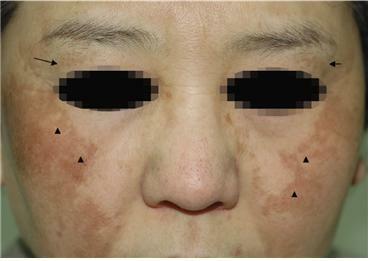 As seen in Figure 1, at the time of initial presentation, the patient had irregular pigmentary lesions spread on the cheeks (small arrows) with angular shape as well as less pronounced angular pigmentary lesions around the eyebrows (long arrows). Based on her presentation, I assumed the type of treatment she received for pore tightening and elasticity was Intense Pulsed Light (IPL). She had both enhance and non-enhanced lesion under the Wood’s lamp examination. 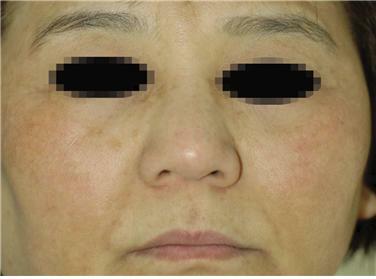 Post inflammatory hyperpigmentation (PIH) is a rather common side effect among Asian patients with darker complexion and dermatologists should be careful to avoid this side effect. 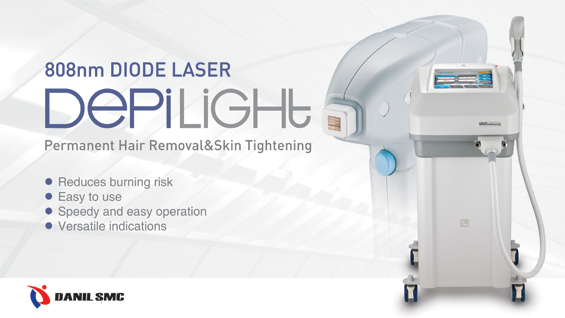 When IPL was first introduced, it was reported to improve various aspects of photo-aging and had little down time or side effects. It is widely applied in clinical practice. After its first use in treatment of vascular malformations in 1976 by Mulbauer et al. (Muhlbauer W et al, Langenbekcs ArchChir 1976;suppl:91~94), IPL has gone through mechanical and software improvements to enter the market as a new promising medical laser device starting in early 1990s. Its versatility and many clinical applications can be very useful for trained and experienced doctors. However, IPL can cause nonspecific thermal damage when used by a less experienced doctor who does not have the expertise to carry out selective treatment. In our outpatient clinic, I very rarely encounter patients who did not receive IPL in their previous dermatology clinic. It seems that Korean patients in particular, have IPL as their first choice of dermatological treatment. However, IPL is not always effective or safe and the treatment using IPL requires a lot of experience and accurate understanding on the doctor’s part. In the above patient, I repeated treatment 15 times with 1-2 week intervals using Low fluence Q-switched Nd:YAG (Medlite C3) 1.8~2.0J/㎠ to minimize erythema around the pigmentary lesions. After 15 procedures, clinical improvement was observed as shown in Figure 2.